UNIV6 Number of Punchouts: 6 Punchouts Features: -Universal XLR Female Punchouts - fit Neutrik FP, MP, MDL, FDL, small Speakon, Switchcraft female XLR's, Cannon, Whirlwind (male XLR's fit as well, but leave a gap on sides). 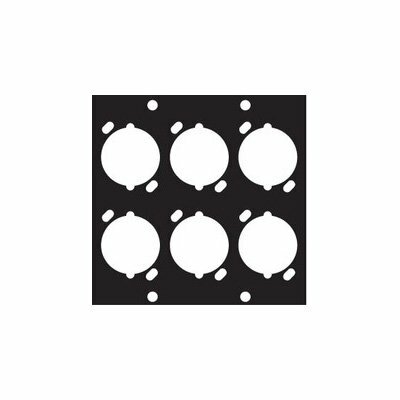 -Strong interlocking system eliminates panel deflection while inserting or removing connectors. -Modular assemblies bolt together using supplied hardware. -Hardware is flush to create professional appearance with no gaps. Product Type: -Cable Management. Dimensions: Overall Height - Top to Bottom: -3.49 Inches. Overall Width - Side to Side: -3.39 Inches. Overall Product Weight: -0.15 Pounds.